Anyways- atlasobscura.com had a neat-o description of visiting their brick-and-mortar location--- which basically sounds like heaven and makes me even more interested in giving their products a go. Behind a chain link fence on an industrial road in Turners Falls, the sounds and smells of a jungle greet me as I open the door and step inside. Upon entering the unassuming building, I am face to face with dozens of vivariums - glass tanks teeming with plant and animal life. Some tanks are covered in algae, some present charming landscapes of moss and tiny flowering ferns. All of the tanks boast unusual inhabitants, and upon closer inspection, they become visible amongst the greenery: poison dart frogs. 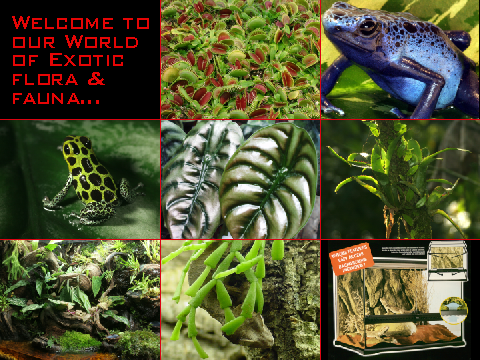 Black Jungle owners Richard and Michael claim to be the biggest terrarium and vivarium supply store of their kind in the country. Most of their business is done online, but that doesn't stop them from keeping their storefront open occasionally for local customers and curious passersby. Their original passion is poison dart frogs, who (as they'll be quick to point out) are only poisonous when they eat poisonous insects in the wild. These frogs, bred in captivity (in the "tadpole room" in the back of the building) are as harmless as a common toad. They come in every color of the rainbow, and crouch awkwardly in the nooks and crannies of the tanks. Richard or Mike will be more than happy to guide you around the store, rustle up frogs from their hiding spots, and show off their latest additions to their menagerie. Tropical birds flap around in cages eight feet tall, flat translucent glass frogs hide secretly on the undersides of leaves, and fountains or terrariums are tucked into all corners of the store. As if this discovery weren't enough, the main treat is to be found in the giant greenhouse next door. Hundreds - if not thousands - of tiny pots house tropical plants of every color, texture, and size imaginable. Wild weeds reach up to the ceiling and wrap themselves around their neighbors. Established palms and vines drip moisture onto the insects and flowering plants below. Two chameleons and a handful of other amphibians hide in cages half covered with vegetation. The air is thick and fragrant, and it’s easy to lose yourself for the better part of an afternoon marveling at the diversity of plant life for sale – and on display- in this small town in Western Massachusetts. If you see Richard or Mike, they may have time to teach you about the species they breed, requirements for building a vivarium, and tips for keeping your pet amphibians moist and warm. By the end of your visit, you probably won't be able to resist buying some sort of life form, be it plant or animal. It's probably a good idea, too - consider it the admission price for a visit to a one-of-a-kind zoo and greenhouse rolled in one. Never bought from them - but a great web site, endlessly interesting. again, late to the party but I order from Black Jungle ALL the time. i love to order succulents in bulk and I also love to use the trailing maidenhair. They ship pretty quickly (only mon-wed though as far as I know). My only complaint is that sometimes the plants can bruise in the shipping process but this is typically minimal.